Cincinnati, OH – Trade shows are expensive. As costs continue to escalate, exhibitors seek promotions which are memorable, trackable and affordable. Core-Mark has found a solution that works well for their distribution company, the vendors whose products they sell, and most importantly the customers that they both serve. The centerpiece of the program is a sales incentive program based on custom coins. As one of the largest distributors of packaged consumer products to the convenience retail industry in North America, Core-Mark knows that trade shows are a great way to show (and sell) products to customers. That is why they host regional trade shows each year. Last year the Pennsylvania region “had their best and busiest show ever” according to Senior Buyer Don Gavlick. 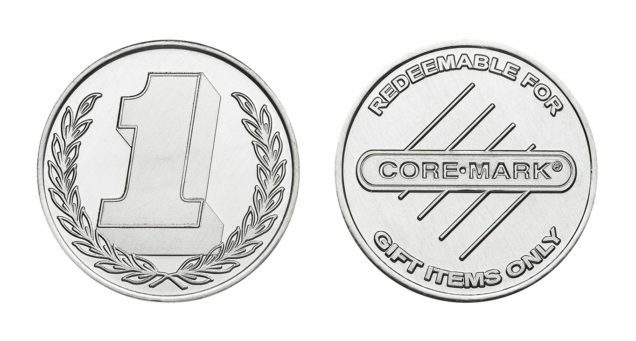 A unique sales incentive program centered on custom prize tokens was responsible for a large part of that success. The promotion is a pretty straightforward one. Gavlick had custom coins minted which included the Core-Mark logo along with a point value. He then purchased prizes – ranging from consumer electronics to trips – to stock the redemption booth at the show. When customers purchase products from the vendors at the show, they earn points which are awarded with the prize tokens. Each vendor is able to determine how the prize tokens were distributed – whether based on sales volume, new product purchases, or for breadth of product line sales, and so forth. Customers typically attended the show, making purchases throughout the day, and stopped by the redemption booth at the end of their day to make a final purchase – this time for themselves rather than for their company. Most of the items were available to take home that day, while large items were drop shipped. The results were great, as the prize tokens “definitely generated a lot of interest from the customers” recalls Gavlick. Gavlick, who is fairly new at Core-Mark, had used similar coin-based programs in the past with success. He started the program by ordering 20,000 of the custom tokens from Cincinnati-based Osborne Coinage. Then, he purchased premiums – which ranged from about $20 for household electronics, to into the thousands of dollars for trips – for the redemption booth. The cost of the premiums was then used to determine the price of the coins, which were sold to vendors (to off-set the cost of the premiums). While Gavlick tried to pre-sell coins to the vendors ahead of time, there were several vendors who were hesitant and did not purchase coins beforehand. Once the show started, however, and customers began asking about them, the previously-hesitant vendors quickly became sold on the idea – hurrying to find Gavlick to purchase prize tokens. “Customers caught on quickly to the value of the coins, and used them as bargaining chips to buy more merchandise from the vendors” comments Gavlick. With one successful show under his belt, Gavlick is already planning for the next one. Since the custom prize tokens are re-usable year after year, the coins purchased last year will be functional for this year’s event. Gavlick will, however, pre-bag the coins and try to sell them ahead of time. Gavlick will, however, pre-bag the coins and try to sell them ahead of time. Since many vendors return year after year, those who were on hand last year and enjoyed success with the program will be eager to purchase coins and begin talking them up with customers. Getting the word out early this year – both to the vendors and to customers – should help ensure another successful venture. With costs escalating and vendors looking closely at trade show related expenses, companies are looking for memorable, trackable promotions that generate results. That is precisely what Core-Mark has found with their custom coin based sales incentive program. How does Gavlick and his Core-mark team hope to follow-up “their best show ever?” Based on customer and vendor feedback, they are anticipating another strong trade show in 2009, thanks to the excitement created by the prize token sales incentive program.